THIEF RIVER FALLS, Minn., March 14, 2019 /PRNewswire/ -- TE Connectivity (TE), a world leader in connectivity and sensors, has named Digi-Key Electronics, a global electronic components distributor, the recipient of its "2018 High Service Global Distributor of the Year" award.The award was presented to Digi-Key during TE's global summit which was held in San Diego, CA. "Digi-Key had a record year in 2018, achieving strong sales growth and expanding its customer base in all three regions. I applaud this valued global distribution partner's success in 2018 and look forward to furthering our partnership to better serve our mutual customers," said Joan Wainwright, president, Channel and Customer Experience at TE. The 2018 Global High Service Award was based on strategic categories that are matched to TE's business initiatives and growth priorities, with a focus on sales growth, customer growth and new product investments. 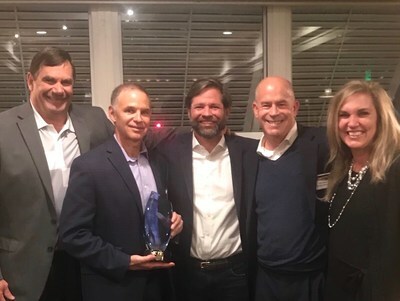 "We are honored to receive this prestigious award as a testament to the outstanding sales and customer growth we have shared with TE over the years," said Chris Beeson, EVP Global Supplier & New Business Development at Digi-Key. "TE's commitment to utilizing our NPI program and other marketing efforts illustrates a great example of the collaborative relationships we strive to have with our supplier partners." For more information, or to order from Digi-Key's full line of TE Connectivity products, please visit any of Digi-Key's global websites. Digi-Key Electronics, based in Thief River Falls, Minn., is a global, full-service distributor of both prototype/design and production quantities of electronic components, offering more than 8.4 million products from over 750 quality name-brand manufacturers. With over 1.6 million products in stock and an impressive selection of online resources, Digi-Key is committed to stocking the broadest range of electronic components in the industry and providing the best service possible to its customers. Additional information and access to Digi-Key's broad product offering is available at www.digikey.com.